At Northwest Dental our philosophy and approach to dentistry is clear: we listen to and learn what you want. We can provide the dental care you require in a lot of different ways – we just need to understand what you desire in order to keep you smiling! 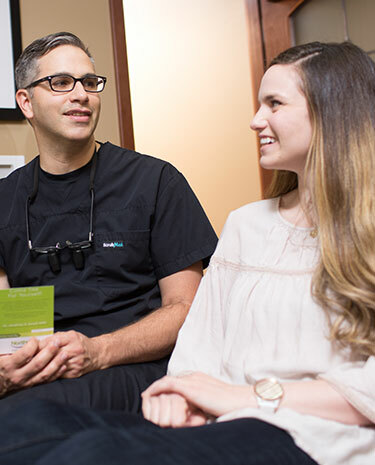 Dr. Jonathan Smart and our team members are dedicated to delivering high-quality dentistry, with a focus on personal service. We care about the person who owns the smile. You are unique and we are excited to meet and get to know you. Dr. Smart and our team truly believe that what we do is not about us, but about you and what you want and need. Each visit and every procedure is unique, because it’s designed around you. We are truly family-friendly, caring for everyone from toddlers at their first visit through older siblings, parents, grandparents, and great-grandparents. We enjoy seeing families grow and change over the years and are glad to be part of their lives. We want you to feel like coming to the dentist is less of an event and more of time spent with friends. We don’t want visits to be disruptive or stressful, ever, and will work with you to make everything go smoothly. The health of your mouth and your body are closely interconnected: what happens in one affects the other. If you value wellness, we can help you improve the health of your smile and your body. Dr. Smart and our team emphasize education: ours and yours. We stay at the forefront of ongoing developments in dentistry through continuing education courses. By studying the latest techniques and technologies, keeping abreast of research findings and debates, and constantly expanding our knowledge, we’re able to offer you the best options and experience. We also spend a lot of time sharing what we know with you. We’ll explain how changing your home oral hygiene routine can improve your smile and overall health. We will also talk about nutrition and support you as you develop better habits. We want you to live a full, happy, healthy life; taking care of your dental health is part of that process! Please contact our Corvallis family dental office, serving Lebanon, Albany, and all surrounding areas, to schedule a complimentary, no-obligation consultation with Dr. Smart. All of us at Northwest Dental look forward to meeting you and learning who you are; please, call today!